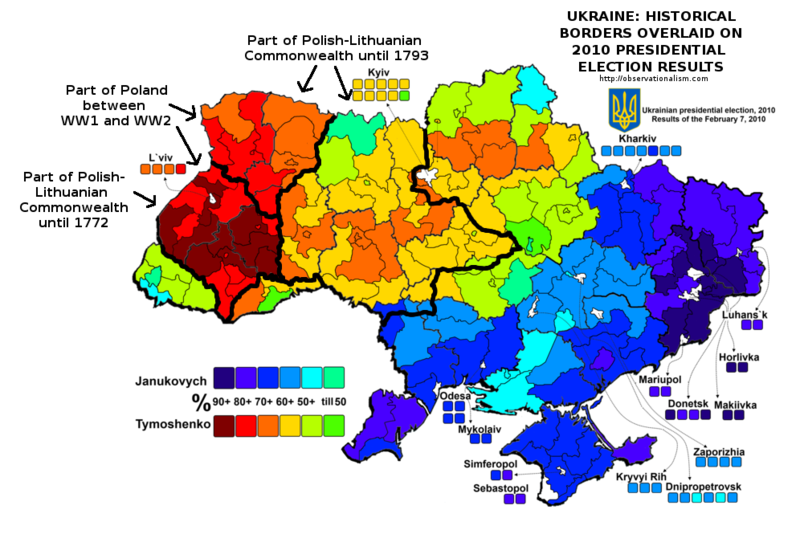 Ukraine was an extremely polarized electorate, and a glance at the electoral map of the election that voted into office the man whom Obama’s forces overthrew shows this very clearly. As you can see there, around 90% of the people in the region in purple at the far eastern end of Ukraine had voted for Viktor Yanukovych, whereas around 90% of the people in the red far western end had voted for Yulia Tymoshenko. Tymoshenko represented the rabid Russian-haters, and Yanukovych represented the «Party of Regions», which favored a sort of «rainbow coalition» of the regions that had favored Hitler over Stalin, and of the areas that had favored Stalin over Hitler. (Back in the 1940s – before the Cold War – there was no democratic option for Ukrainians.) Whereas the northwest had favored Germany, the southeast had favored Russia – and, in between those areas, were the voters who were somewhat balanced between the two parties. On the other hand, also the south of the country was far more drawn toward Russia than it was toward Germany, and this southern strength for Yanukovych was another reason why Yanukovych beat Tymoshenko (i.e., won the 2010 election – the last democratic election throughout the Ukrainian nation). The south includes both Odessa, the site of the Obama operation’s crucial massacre of coup-opponents, on 2 May 2014; and also Crimea, whose residents that had been demonstrating in Ukraine’s capital of Kiev against the anti-Yanukovych demonstrators there, were likewise massacred, on 20 February 2014, while they were fleeing from Kiev right at the peak of Obama’s Ukrainian coup. The February 20th massacre of Crimeans caused the residents in Crimea to be terrified of Obama’s people; and this is one of the reasons why Crimeans immediately clamored for independence from the new, Obama-controlled, Ukraine. Furthermore, all polling had always shown that the residents in Crimea were always more favorably inclined toward Russia than toward Ukraine. Moreover, Crimea was historically part of Russia, not of Ukraine. The communist dictator Khrushchev in 1954 had transferred Crimea to Ukraine (without holding any plebiscite, of course), but Crimea had for hundreds of years been part of Russia, and that self-identification of Crimeans as being Russians not Ukrainians, continued right up to the present day. This self-identification was indicated on that 2010 election-map by Crimea’s having voted around 75% for Yanukovych (the man Obama overthrew); but, after the massacre of fleeing Crimeans on 20 February 2014, the percentage of Crimeans who wanted to rejoin with Russia appears to have soared. Therefore, they were clamoring for a Crimean referendum on the issue of rejoining Russia. Obama’s people strongly opposed that. Putin’s nation, Russia, had its Black Sea Fleet located on Crimea (ever since 1783), and so he decided to protect Crimeans’ right of self-determination of peoples. It was an authentic matter of Russian national security, but nonetheless Putin refused to do this by force; he wouldn’t do it at all unless the people of Crimea wanted it done – finally had their plebiscite, which Khruschev had denied to them. Putin respected their rights, and was willing to relocate the fleet elsewhere if they didn’t want it to be there. (By contrast, Okinawans protest against the US military base, «Killers go home!» but Obama refuses.) Obama’s operatives now controlled the Ukrainian police forces on Crimea and ordered them to prevent the referendum from occurring. The Crimean public were outraged at that official resistance, and therefore most of the police (being Crimeans themselves) defected to the side of the Russian government and of the Crimean people. The referendum vote turned out to be more than 90% in favor of their becoming Russian again. Independent polls taken both before and after the plebiscite also showed 90+% support for the change. Nobody anymore even questions whether the plebiscite’s result reflected the authentic will of the Crimean public. Even a Gallup poll of Crimeans taken shortly after the plebiscite found that only 2.8% of Crimeans had a favorable view of the US; over 97% did not. They didn’t detest the US because they’d been swayed by propaganda, but because they no longer could be swayed by any such propaganda; they detested America only because of what they saw and heard with their own eyes and ears. Regarding Crimea, therefore, what NATO and Obama and Bloomberg (etc.) mean by saying that «Putin invaded Ukraine in 2014» is referring to what has just been described here – something (their safety and freedom) for which the Crimean public feel immense relief and gratitude. The way that the final «Warsaw Summit Communiqué», issued on 9 July 2016, put the matter (of this having been Putin’s seizure of Crimea), was to repudiate «the ongoing illegal and illegitimate annexation of Crimea, which we do not and will not recognize and which we call on Russia to reverse». That annexation actually constitutes the central charge by Obama and his team, against Russia, alleged to justify his economic sanctions against Russia and his quadrupling US troops and weapons on and near Russia’s borders, which that NATO Summit was celebrating and endorsing. It’s the alleged cause of NATO’s war against Russia, surrounding Russia by hostile missiles and troops. Regarding the independent separatist region of (the former) Ukraine, which is called Donbass, and which consists of the two adjoined regions Luhansk and Donetsk, that’s the area which had voted 90% for Yanukovych. They had become terrified mainly by the massacre which had occurred in Odessa on 2 May 2014; so, their decision to separate from Ukraine came more than a month after Crimea’s did. Russia had no naval base or any other military facility there, but, if a plebiscite were to have been held, then – especially on account of that massacre in Odessa (on top of the fact that people of Donbass had voted 90% for Yanukovych) – the vote to become part of Russia would probably have been even higher. All through that, there has been much publication in the US alleging that Russia was invading Ukraine and that the fighters for independence were Russian soldiers. The reason for the speculation about this was that the people fighting for independence were winning. By the end of June 2014, it was clear to any honest reporter that Obama’s forces were losing, despite American assistance. Many Russian men joined the Donbass freedom-fighters, out of principle to help the people of Donbass survive (and everyone in Russia was hearing and seeing in Russian media the statements by the Obama-installed Ukrainian leaders, constantly spewing hate against Russia), but no Russian troops were fighting there. However, late in August, Putin was fearing that if he didn’t speed up the victory that the locals were already winning, then the residents of Donbass would end up freezing to death through the coming winter. He then decided to send in some actual Russian soldiers. He continued to deny (but only for a brief period) that any were there, but they now were. There is no indication that after early September, at the latest, any remained in Ukraine. The impact of the participation by Russian state forces – no longer just ordinary people of Donbass who took up arms – now fighting the Ukrainian state forces, was crushing and decisive; it saved the Donbass people from unimaginable death out in the cold of a Ukrainian winter. The war continued on, but now Obama himself recognized that military conquest of those areas of the former Ukraine was impossible, and so, from that time onward, he moved forward only on his more important objective: using the «Putin invaded Ukraine» theme as his basis for strangulating Russia with economic sanctions and ramping NATO up to invade Russia. By January of 2015, even a Ukrainian general admitted that no Russian soldiers were involved in the war. However, there was yet stronger proof that Putin never «invaded Ukraine». As I headlined on 19 September 2014, «Putin Rejects Ukrainian Separatists’ Aim to Become Part of Russia». He refused to allow Donbass to become part of Russia: he would provide them essential supplies, and strategic guidance, as before, but told their leaders that they’d have to establish their own independent nation, and maybe someday rejoin, as a relatively independent federal region (as already laid out in the Minsk agreements), Ukraine, after the Ukrainian government either complies with Minsk II or else collapses and Obama’s regime there gets ousted and replaced by people who are decent. Anyone after that time (September 2014) who has alleged anything like «Putin invaded Ukraine» has been either lying or else blatantly ignorant. This includes virtually all of the Western press. On the same day, 9 July 2016 (the concluding day of the NATO Summit), when one of Bloomberg’s ‘news’ stories reported that «Putin invaded Ukraine in 2014», a Bloomberg editorial was published, representing the opinion of the former Mayor of Wall Street, Michael Bloomberg. It was titled «NATO Needs to Stand Strong Against Putin», and it called for NATO to «expand and strengthen its deployment of four battalions to the Baltic nations, to make it a more credible deterrent. It should conduct more joint exercises in Europe, especially in the Baltic Sea, and see that Germany begins to participate more fully. It should also beef up its ability to coordinate its member countries’ intelligence resources, not least to monitor the surprise military training exercises that Russia has been conducting». The actual «surprise» has been that Obama is willing to carry his brinksmanship this far. Khrushchev didn’t.